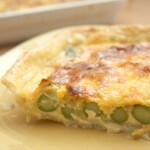 With two kilograms of this seasonal veg in the fridge, I was bound to make a cheese and asparagus tart! As is so often the case in Poland, our friends downstairs know someone, who knows someone who is growing organic asparagus. Our friends buy a lot of the asparagus every year at this time, we’ve been the recipients of part of their annual organic asparagus haul. 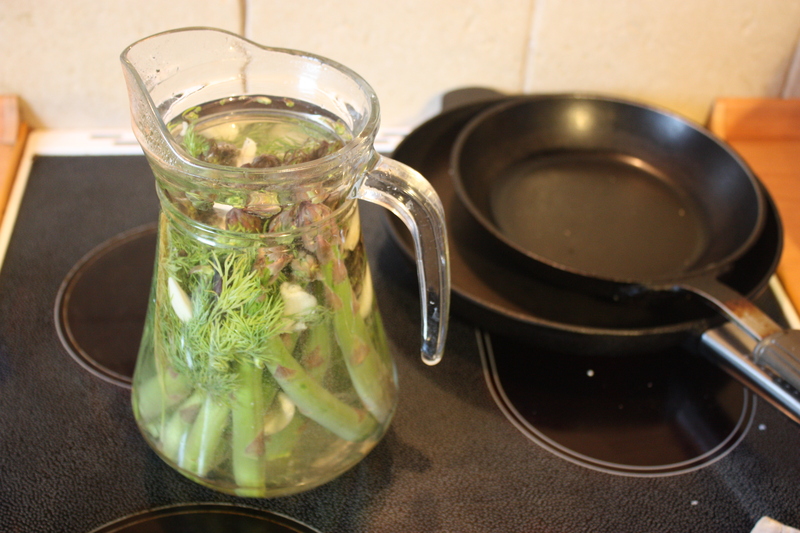 Two kilograms of asparagus is more than I would usually buy at one time, but this is so fresh that it’s keeping well. 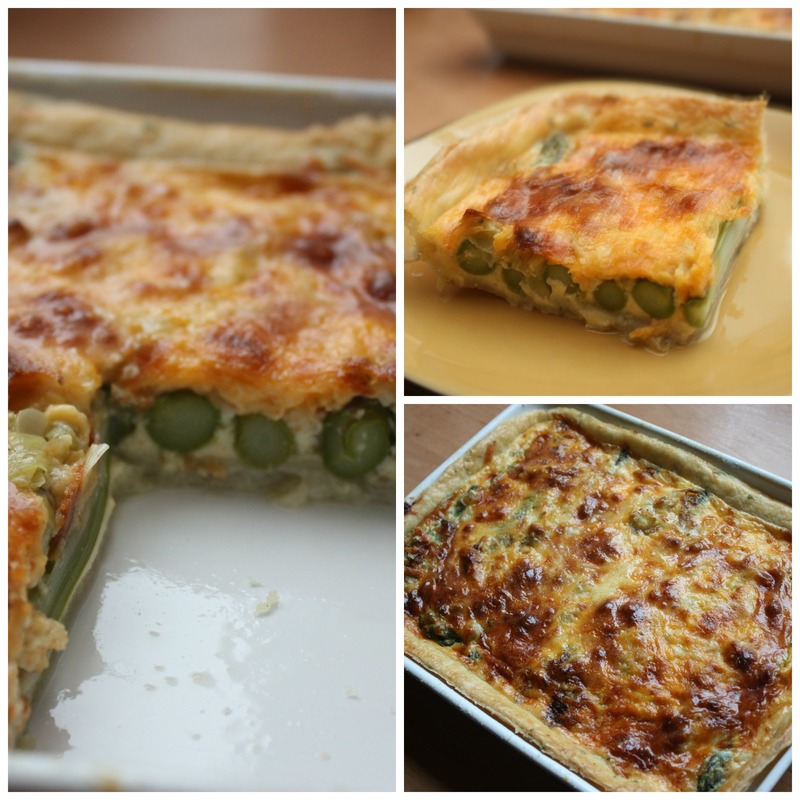 So far, we’ve wrapped asparagus in bacon; we’re preserving asparagus in brine, and now a tart. While pulsing, slowly add ice water, using just enough for the dough to form a ball. Don’t overwork it. Shape the dough into a 5 inch disk, wrap in plastic, and chill at least one hour. Roll out dough to fit your baking pan; I used a shallow 8 x 11 pan. Place dough in pan, trim crust, I just cut it at the top of the pan, no fancy fluting or anything. Mix the eggs, cream, salt, pepper, and cayenne, and pour into crust. 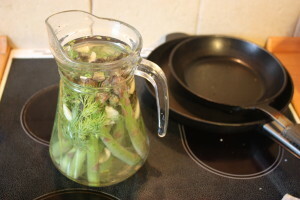 Remove the woody ends of the asparagus by holding the bottom and middle of the stalk and snapping. Add asparagus to the pan, lining it up side by side. Allow to set up for 10 minutes before slicing. 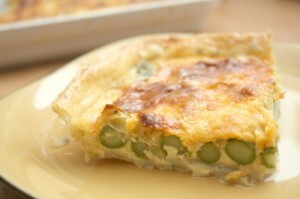 Reheat in a 350 degree oven for 5 – 10 minutes, microwaving will make it soggy. Enjoy it! 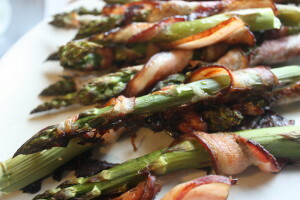 When I was a kid we each got one vegetable we didn’t have to eat, and mine was asparagus. Even though I was the family cook starting from 10 years old and I knew how to walk down the land and harvest it from the ditch, I still wouldn’t and still don’t eat it! So Lori, are you saying you have never tasted it? What puts you off , just the smell or look? I don’t think I ever saw asparagus as a kid. My folks grew it for a while, long after I was out of the house, but gave up because it just takes too much water in AZ, where water bills are very high.